Follow these 4 fundamentals for coffee at home that’s as perfect as in a Starbucks! 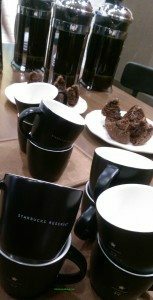 On March 24th, I went to a coffee education seminar at the University Village 3 Starbucks, where partner Kyle reminded us about the four fundamentals of making a great cup of coffee. This is always a great reminder! 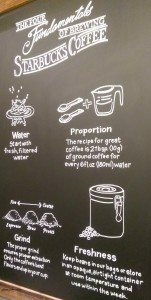 When you compare badly made coffee with great coffee, you’ll be reminded that these four things really do make a huge difference! Using Starbucks Guatemala Antigua coffee, Kyle made four French presses of incorrectly made coffee and we compared each with the correctly made coffee. 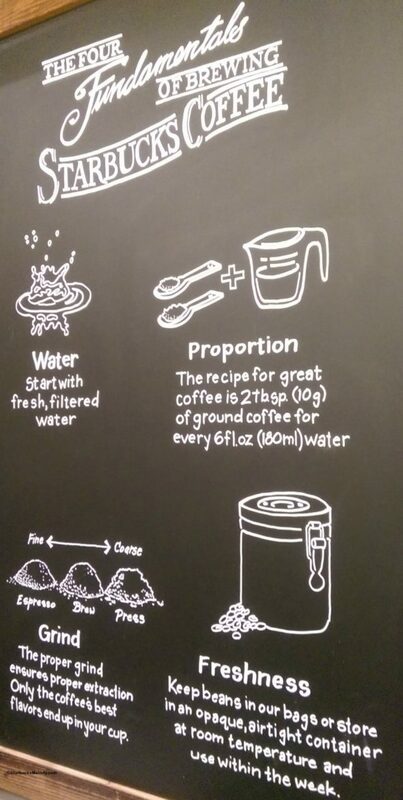 Proportion – Starbucks recommends 2 tablespoons (10 grams) ground coffee for every 6 fluid ounces of water. Water – The water you use should be clean, fresh and free of impurities. It almost goes without saying, but this means that you should not store coffee in a freezer, toss out old coffee (please put it in your city composting – in the city of Seattle, you’re required to compost), use filtered water, and have a great coffee grinder that has settings for how course or fine you want your coffee. Check the expiration dates on your coffee at home. Toss it out if it’s expired! Or toss it out if it’s been open more than seven days. As we compared the badly made coffee with the correctly made coffee, I thought that the coffee made with the wrong proportion was the worst! Kyle used about half the right amount of coffee, and so the coffee came out too weak. If you want weaker coffee at home, make your coffee correctly, and then after it’s brewed, add water. I’m sure we all have horror stories of opening up a freezer at a friend or family member’s house and being stunned by the old coffee stashed away next to heaven-knows-what. 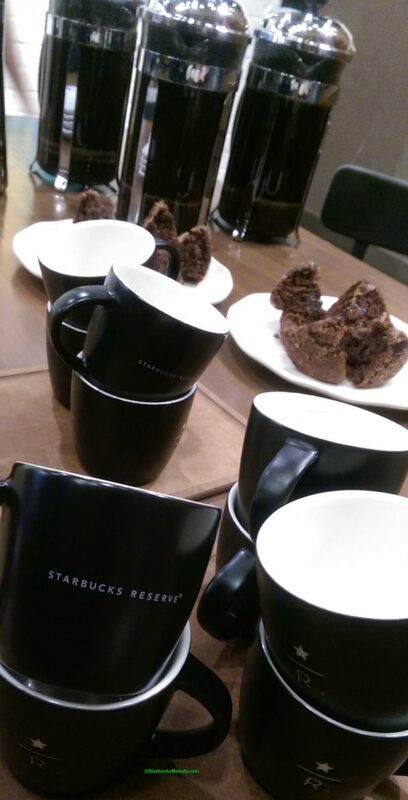 When in doubt, go out to Starbucks to get a perfect cup of brewed coffee! By the way, there are a very large number of home brewing methods – pour over, Chemex, Aeropress, French press, traditional coffee makers, and more. How do you enjoy your coffee at home? Starbucks Volcano King Coffee: *Almost* The First Uganda Single Origin Coffee. Coffee Tastings This Week: Zambia, Peru Chonti, and Deschutes Inversion IPA. Hi Melody! Sorry I haven’t commented in a while. I’ve done seminars on this topic before, and it’s truly amazing how even missing one of the four fundamentals impacts your press (or pot) of coffee. I often wonder how many people are making their coffee without following any of the four fundamentals… Probably quite a few. As for my coffee at home, it is 80% Keurig, as it is fast, no mess/cleanup, and tastes very close to a brewed coffee. I’ve been enjoying Tribute K-Cups the last few days. Good article, Melody. I do all of the above and have made huge strides in getting my 80 year old mom to do the same. Breaking the freezer habit has been the hardest thing to do. I even saw a segment on a talk show a week or so ago that had an “expert” telling us how to store food items. She, of course, said to store coffee in the freezer or fridge. Ugh! @Becky E – You just made my hair stand on end with any “expert” saying to store coffee in a freezer!!!!! @Melody – Everything is good. I’m still at Becca’s store. As for K-Cups being watery, I agree. However, they’re made to be brewed at an 8oz size, but I brew most of mine on a 6oz setting and it solves the problem. I highly reccomend and abide by these guidelines. Its the onky way to make the best cup of coffee. No wonder why guests at my house think my coffee is so flavorful! 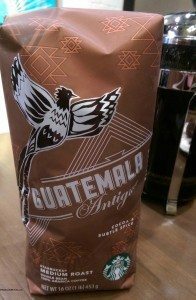 😉 I always suggest that if they buy great high quality coffee (such as Starbucks) and brew correctly they’ll get the same delicious cup wether its at home or at Starbucks or at any high end coffee shop. What about iced coffee? I’ve tried cold brew, but I’m pretty sure that’s not how Starbucks does their iced coffee. @Duong Nguyen – That’s a good question. When brewing iced coffee, always brew double strength. You can double the amount of coffee but keep the water the same.. The reason is that you want to make iced coffee stronger to be poured over a cup full of ice – as the ice melts it won’t be so dliluted. Starbucks traditional iced coffee is brewed double strength – just tastes better that way!